The bush is the furthest place you would expect to find cutting edge technology and innovation, however over the past year Londolozi has been hugely active in creating an environment where high tech meets high touch. Firstly with the development of new safari offerings such as the Zero Emissions Vehicle and the Photographic Safari Experience, then in the creation of an online experience for our friends who cannot be with us here in person. We are delighted that Rich Laburn is going to be participating as a blogger at the Social Media World Forum, taking place in London this March. This two day conference is at the cutting edge of new media trends, initiatives, developments and research. It is a culmination of keynotes, discussions and emerging technology ensuring those who attend will be better equipped to share and discuss how the web is evolving. 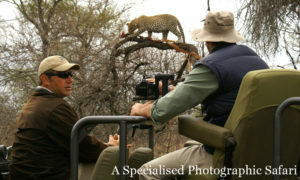 For Londolozi it is going to be interesting to explore the new technologies and trends presented. This conference will be featuring four dedicated conference streams, international speakers from global brands, interactive workshops and a comprehensive exhibition. Whether high tech or high touch is your preference, the development of both will be more and more available to you on ‘Londolozi Live’. The event will take place at the Olympia Conference Centre and you can get discounted tickets by booking before the 15th February 2010. To book your ticket and find out more about the Social Media World Forum click here.